Please note: The following text and photos are provided by p1michaud and are modifications that he has made to his own 1999 Toyota Tacoma. This article is not intended to suggest that anyone else should add this modification to any vehicle, nor is it intended to be comprehensive instruction. The owner of this website, and it's contributors and editors cannot be held responsible for any damage done to any persons or property due to modifications as shown herein. If you wish to perform or install such modifications as illustrated on this website, you must do so at your own risk. Aside from the minor welding involved I would rate this mod as easy. My stock battery was starting to shows signs of age after 6 years of use. Mostly noticeable when it was -22° Fahrenheit (-30° Celsius for us Canadians!). So I figured it was time to buy a new one. After some research I determined that I needed an Optima Red Top model 34R. 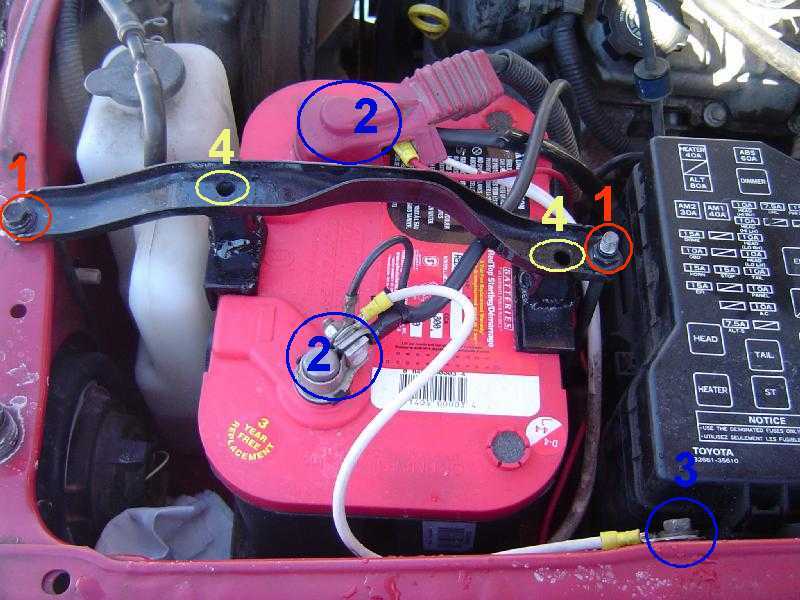 The 34R is just like a regular Optima Red Top battery, but it is outfitted with reverse terminal posts. In other words, the positive and negative posts are specifically reversed, so that they match the locations on a stock (OEM) Toyota Tacoma battery. I shopped around and was just not ready to pay $280 CDN for a 34R. The only place I could get one except for eBay was from a Canadian distributor in another province and it was just going to be a major pain to get it to my front door. I knew WalMart carried Optimas for about $160 CND. So I bought an Optima Red Top model 34/78. I chose the model 34/78 due to price and availability. This was the cheapest I could find it here. So now the challenge was to make it fit! If you get a good deal on an Optima Red Top model 34R, by all means, go this route. In either case, what you need to be concerned with is the height difference. The Optima is about 1.5" shorter in height than the stock batery, but otherwise the same dimensions. Optima makes a spacer that clips on to the bottom of the battery for this purpose. These spacers are not always available, in which case you can modify the original hold-down bracket with some minor welding and fabrication as you will see in this article. By using the modified bracket, the top of the battery is lower than stock, and the OEM cables are able to reach the terminals on the 34/78 model. If you use the spacer with the 34/78, you will need to verify if your OEM cables will still reach the terminals. (Variation in cable length is a possibility.) If the cables are too short, then it may be possible to mount the Optima on it's side, since they are sealed, and capable of side-mounting. We just wanted folks to know that a 34/78 model can be made to fit if they can get a good deal on this battery configuration, or are limited to "stock on hand" batteries. Step 1: Removing the old battery. Using the 12 mm socket, remove the 2 bolts (item 1 Figure 1) holding the battery bracket and battery in place. Don't lose them! 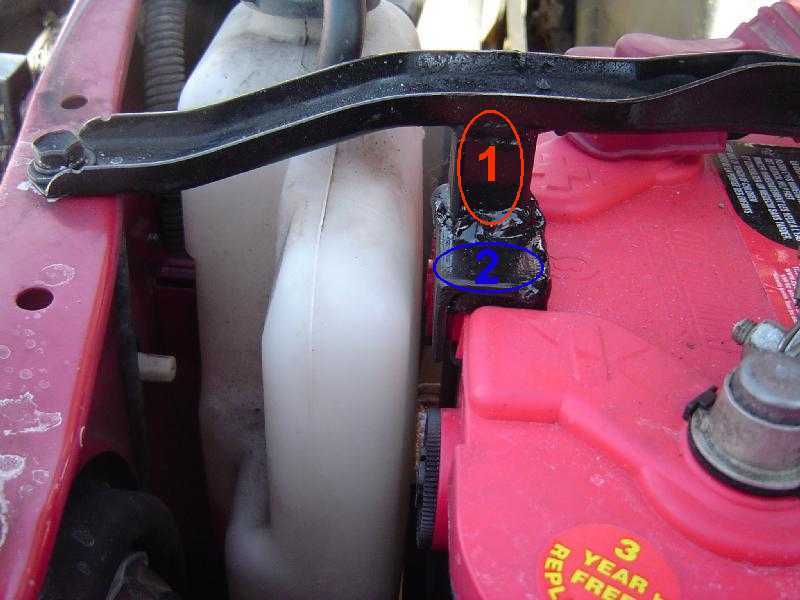 Next, using the 10 mm wrench or socket, remove the 2 battery cables (item 2). Remove the negative battery cable first, then the positive cable. Now go ahead and remove the old battery. I decided to modify my bracket because the positive battery cable would have been too tight for my liking if I spaced the battery up and used the existing bracket, more on this in Step 3. I first started by drilling out the spot welds holding the existing angle brackets for the stock battery. (No pics of the original bracket, but you can see the 2 holes where the brackets used to be. Refer to item 4 Figure 1.) Next place your new battery where the old one used to be. I re-used the existing (OEM) plastic tray beneath the new Optima. 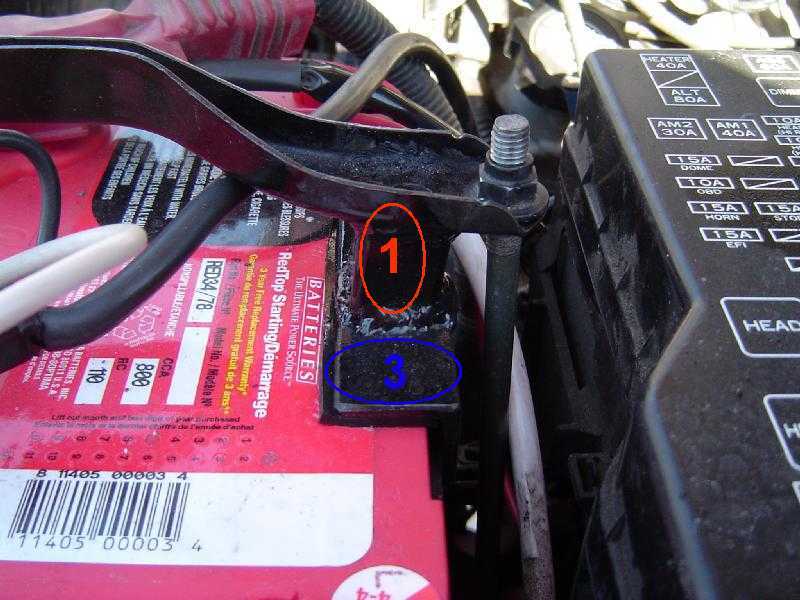 Temporarily re-install your battery bracket to allow you to take reference measurements. In my case, the difference in height was about 1 ½". I then used ¾" by ¾" square tubing with 1/8" wall to make up the difference in height. Refer to items 1 in Figures 2 and 3. These were about 1 ¼" long in my case. Make sure to measure for yourself. Measure twice, cut once! Next, I cut 2 pieces of ¾" angle by 1/8" thick that would hold the battery securely in place. Refer to items 2 & 3 in Figures 2 and 3. Item 2, Figure 2 was approximately 1 ½" long while item 3, Figure 3 was approximately 4" long. Again, measure for yourself to make sure before cutting anything. Now it was time to test my welding skills or lack of! No laughing at the booger welds, they hold and that's what's important. I tacked everything together and test fitted the modified bracket to make sure. I had to make a few adjustments but it looked good so I went ahead and welded everything in place. Now just paint the bracket to make it look better and prevent it from rusting. I then cut 2 pieces of the 1/8" rubber gasket and glued them to the new angle bracket. If you look closely you can see them in Figures 2 and 3. Step 3: Modifying the battery cables. I first extend the "negative battery post to ground" cable. This is the small wire that goes from the negative terminal to the sheet metal near the lip of the hood. This is easily accomplished by using 12" of 10 Gauge automotive grade multi-strand wire with a new ring terminal crimped on at each end. Remove the 10mm bolt from the negative battery cable and attach the new extension. Note that I just looped my existing shorter body ground back under the 10 mm bolt. Just in case I want to return to stock some day. Remove the bolt (item 3 Figure 1) using the 12 mm socket and attach the extended ground cable to the body. Refer to Figure 1, you can see the extended body ground cable, it's the white one. Next, I had to make the positive battery cable fit. 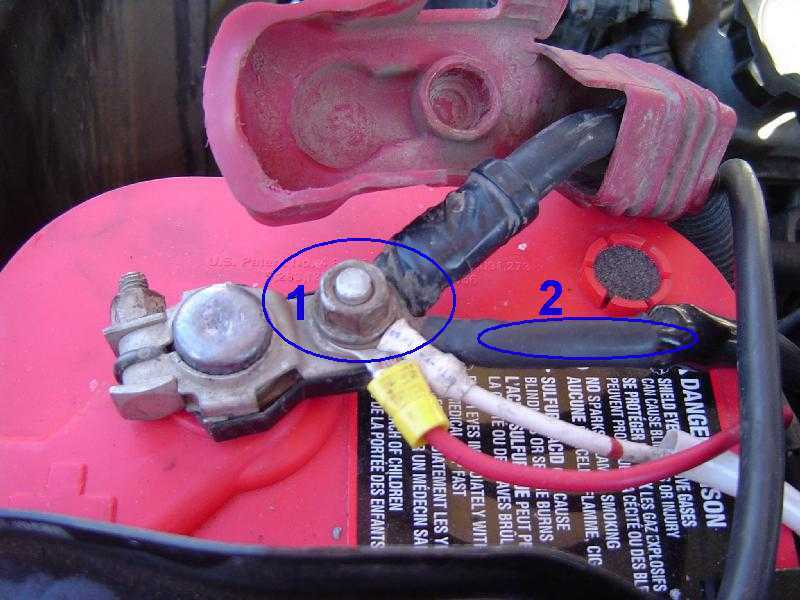 Start by loosening the nut holding all the battery cables to the positive battery terminal. It's the 10 mm nut, refer to item 1 in Figure 4. Now rotate everything about 45 degrees and this should allow you just enough room to make the wires reach the positive battery post. In my case, I had just enough length to get to the positive battery post. I feel that if it were any further, the whole set up would not work without lengthening the positive feed to the fuse compartment. The wire I'm talking about is item 2 in picture 4. Now you can enjoy peace of mind because you have a reliable and durable Optima Red Top sitting under you hood.